Description: Granular sampler for Flux Night 2015 is a collaborative project created especially for Jennifer Wen Ma’s Flux Night 2015 public art project, Bending the Arc. The Bending the Arc software is written in SuperCollider and is designed to listen to a voice, analyze that voice, then send what it learns to a graphics software so the voice can be animated in real-time. The Granular Sampler also records what it hears, and is able to recombine the voices it records and compose a musical mashup that can then be played back organized by pitch. Role: Concept, part of the implementation and part of the user interface design. 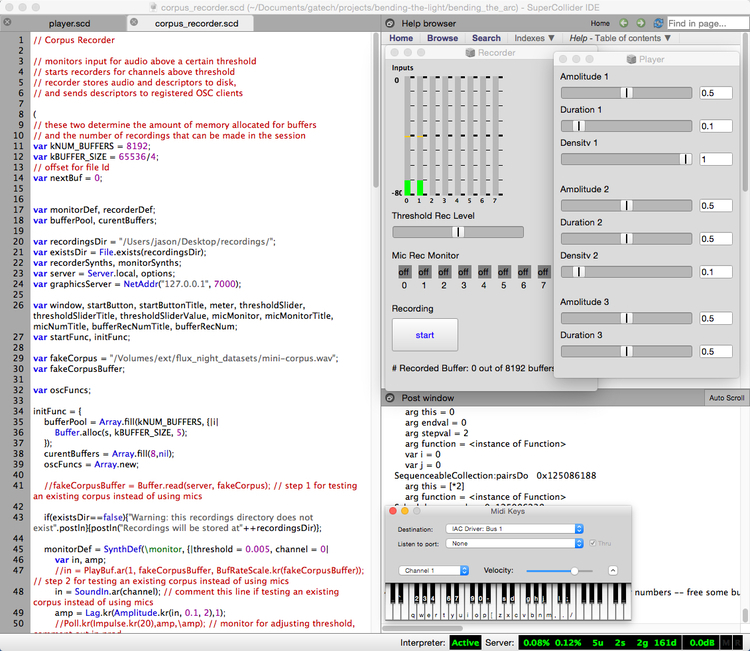 Technologies: SuperCollider, MIDI keyboard, 8 mics.